Since I published my core training concept, “The Four Stages of Luring,” many people have asked me to show them examples of how luring is done. And because a picture speaks a thousand words, I decided to dig into my collection of dog trick lessons to find one that uses this training method. Then I stumbled upon my “Roll Over” lesson—the perfect match! Here’s the video—it’s only about six minutes long and you’ll learn exactly how to teach your dog to roll over. 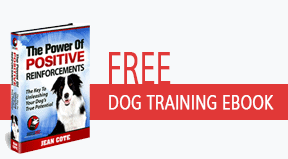 You will also find some additional information below about each stage so you can refer to it while teaching your dog this trick. Then the next step will be to reward your dog for going onto its side. 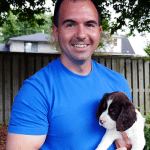 At this stage you move your lure close to your dog’s shoulder blade. Make sure you release the treat and reward your dog once it falls onto its side. Continue to move your lure closer to your dog’s back until your dog rolls over. 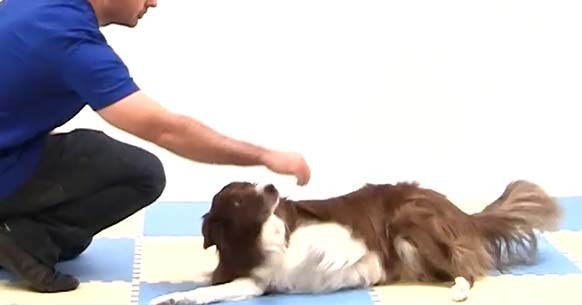 You may need to reward this step multiple times before your dog gets used to the sensation of rolling over. Depending on the size of your dog, you may need to create some momentum by quickly moving your lure toward your dog’s back. This momentum, as demonstrated in the video, will get your dog’s body to follow through and roll over. Please keep in mind that rolling over is not a natural behavior for dogs and can be a little bit scary for them. It’s also recommended that you practice this on a soft surface such as carpet or grass. This will make it more comfortable for your dog. Once you can easily lure your dog to roll over, the next logical step is to teach your dog to respond to a hand signal. You might be wondering why you need to teach a hand signal. The main reason is to keep your dog from becoming dependent on your having food in your hand to perform the behavior. Begin by creating a pattern in which you lure your dog twice in a row for rolling over. On the third repetition, simply pretend you have a treat in your hand and do the same motion. This will fool your dog into following your hand even though you don’t have any food in it. As you become successful at this, you can reduce the ratio of lures to hand signals until it is 1:1, meaning that you lure your dog once and then give a hand signal. Eventually, you will be able to entirely phase out the lures. Then you can gradually make changes to your hand signal until your dog responds to the one that you want. For example, you can practice signaling your dog to roll over and, with every repetition, you can slowly stand. Did you notice that I didn’t give the command “Roll over” until this stage? The reason I didn’t is that dogs need to learn the behavior before it can be associated with a verbal command. And because you’ve just taught your dog the behavior in the first two stages, the only thing left is to give your verbal command, “Roll over,” just before you give your hand signal. The trick for this to work is repetition. You have to do it a good twenty to thirty times, preferably over a few training sessions. Then you’ll want to attempt Stage 4, which consists of saying your verbal command. It’s also a good idea to create a pattern in which you give your verbal command “Roll over” two or three times in a row, and then test your dog’s understanding on the following repetition. I must admit I have an affinity for this trick. It was one of the first tricks I taught my dog, and it gave me such a sense of confidence. After watching the video, I taught my 6 month old lab to do this trick, and he picked it up in less than 10 minutes, but he does not rollover completely, likes to stay on his back and wave his legs in the air. Its become his favorite game now. Thank you so much for the lesson. So I have an issue that is holding my training back, I rescued a Anatolian Shepperd about 10 weeks ago we named Arrow.. They say he’s between 1 & 2 years, I think under a year due to him still teething. Anyway, I really want to add to his obvious training, but we already have 3 older dogs. They have really bad habits of barking at every person walking, biking, or skateboarding by. We live on a busy corner with chain link fence. So how do I approach training no bark now that Arrow has joined in on their bad habit and because he is huge (stands up so his elbows are on the top of the fence) . My fear is him getting over or nipping someone or getting hit. So being overwhelmed I cant heighten the fence due to city laws. What kind of options do I have? I taught my 8 month old rescued Alaskan Malamute mix to roll over in 15 minutes with your great video! He still does not roll over to the quick hand motion only — I must make the down hand motion first and then the rollover while saying the words, but he rolls over completely and is very proud of himself when I lavish praise on him. Possibly when I originally taught him to sit and lie down, I also taught him to ‘lie on your side’ in anticipation of him learning to play dead. He was confused for a bit during the rollover lesson with laying on his side.